Gina and I flew over The Preserve in Allen this morning in the RE/MAX® Balloon. This vantage point gives you a good view of how things are progressing. The development is really starting to take shape! The lake has been completed and is starting to fill. You can also see that the lots have been surveyed and leveled. The roads have been laid out and the developer will be installing utilities soon. You can see the stacks of blue-green pipes at the front of the development. I dropped by The Preserve in Allen yesterday to see how things are progressing. I went around the backside and got a good look at the construction of the main lake. The original lake has been drained (you can still see the old dock) and the heavy equipment is reshaping it to fit the new development plan. Once completed, the dam will be built on the east end and it can be filled. Gina spoke to the builder last week and they are still progressing on-schedule for November presales and initial move-ins in early 2012. We will post more information as it becomes available. The Preserve in Allen – Twin Creeks or Not? Gina met with some of the good people at Ashton Woods a couple of weeks ago. As part of the initial develpment of the 32 acres located in west Allen, they are considering being part of the Twin Creeks master planned community. While the numbers have not been firmed up, we extimate being part of Twin Creeks would add about $600 a year to the Homeowners Association dues. In return, owners would have access to all the Twin Creeks amenities including pools, parks, tennis, walking paths, private lakes, and the softball fields. The golf course has optional user fees but would otherwise be available to residents. What do you think? Would you pay an extra $600 a year for The Preserve in Allen to be part of Twin Creeks and have access to all the Twin Creeks amenities? Let us know below. We’ve been following this project ever since the sign went up on the 32 acres in west Allen. We drove by the other day and the developer has started breaking ground! Most of the large native oak trees had protective rings installed around them so the heavy equipment operators would avoid damaging them. Once the basic layout is completed, they can begin installing utilities and pouring the roads. We spoke to Ashton Woods and they are on-schedule to start pre-selling in November 2011. We’ll post updates as more becomes available. 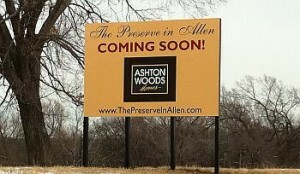 We’ve been following this project ever since the sign went up on the 32 acres in west Allen. The website URL is www.thepreserveinallen.com. The website contains little information and will be updated as the project continues. We will post updates here as new information becomes available.